Attention, Zombies: After far too long a wait, the color edition of Give Me The Brain is finally here. It's more spectacularly beautiful than you can possibly imagine, with full color cards, fifteen new bid cards by Brian Snoddy, and a bunch of new goodies like the Dog Brain, the Mop, and the Piece of String. Come back to Friedey's and see how Cheapass Games made the best card game of 1997 even better. You Need: A six-sided die to represent the Brain. Long hours, ugly clothes, and only one Brain to pass around. But the day is almost over, you've got one more easy task, and life is pretty good. If you can just get your hands on the Brain. 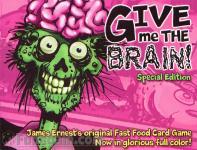 Game Synopsis: Give Me The Brain is a hilarious card game set at Friedey's, the fast food restaurant of the damned. The object is simple: play out your hand. The problem is, a lot of the cards require a Brain, and you've only got one to pass around. Illustrated by Brian Snoddy. Give Me the Brain is a silly but fun card game from Cheapass Games. In this game you are a zombie performing tasks at a fast food restaurant. Some require you to use your brain, some do not. The catch is that there is only one brain! Throughout the game you will scramble for the brain to become the first player to complete all your tasks. Definitely fits into the party game category or for when you just want to waste some time!